Small shiny sculpture that evokes vegetal and marine forms, smooth to the touch and made in bronze casting, according to the ancient technique of French sand molds. 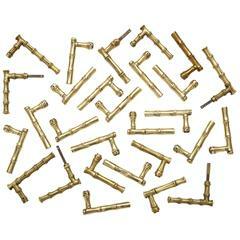 This handles are a sculptural touch for closets, doors or drawers. NB Milano designs and manufactures leather wall coverings, furnishing elements and accessories, upholstered products, chairs and accessories that combine artisan feel, research, experimentation on materials, and avant-garde technical and aesthetical solutions with a sense of aesthetics, deeply in harmony with the mutability of matter over time. The result is a combination of luxury, beauty and a contemporary no border style, through an unceasing search for creativity and exclusivity. The traditions of Italian excellence, our culture, our identity, the love for the Art and craftsmanship, epitomize the beauty of our products, the allure translates into a proposal as “exclusive” and representative of a contemporary luxury lifestyle in harmony with Nature. 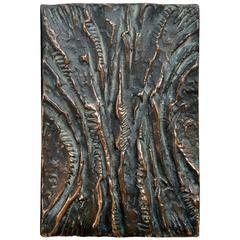 Artistic rectangular bronze cast door handle with a textural relief in vertical curves and dark patina, suitable for push and pull doors. 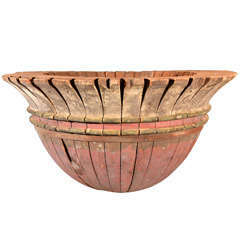 Very interesting French architectural mold, traces of gray and red paint. A piece of sculpture. 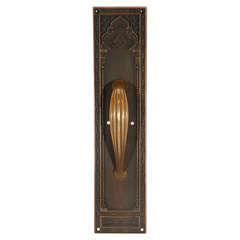 Beautiful cast brass pull handle with Moorish styling.